Last week I didn't do that well I only lost 1 lb. I would of been happy if it was my 4th week because the Weight Watchers book said that the first 3 weeks you normally lose the most. This week I did awesome & I'm very happy about that! I lost 4.6 lbs to make it a grand total of 9 pounds lost since May 3rd!! 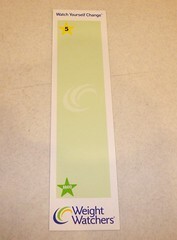 I got my 5lb bookmark this week because last week I was only .4 lbs away from 5lbs which was really annoying. I hope to continue doing good so I can be nice & thin for my wedding! !